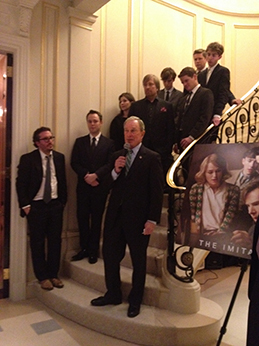 Benedict Cumberbatch and Keira Knightley, stars of The Imitation Game, were still in the U.K. -- he shooting an episode of Sherlock Holmes-- but everyone else from Morten Tyldum's riveting movie about Alan Turing attended this final celebration in an exhilarating campaign season at the Christine and Stephen Schwartzman residence on Park Avenue Wednesday night. Michael Bloomberg, Eric Schmidt, Robert DeNiro, Charlie Rose, Trudie Styler, Damien Chazelle, Oren Moverman, Daryl Roth, Bob Woodruff were among those in heated discussion about Turing's achievement in solving the unbreakable Nazi Enigma code, and then criminalized as a homosexual. Everything from your cell phone to laptop comes from Turing's genius as a mathematician. His treatment as a gay man, forced to take debilitating drugs until he finally killed himself at age 41, was especially embarrassing to the Brits in the art-filled room -- and there were many, including the talented young actor Alex Lawther, Turing in his youth, and Downton Abbey's Allen Leech who here plays John Cairncross, Turing's colleague. Cumberbatch and Knightley are nominated for Golden Globes, as is Graham Moore for his screenplay, and the movie itself for Best Motion Picture-Drama. Before the cast and crew went off to do their Q&A at a SAG screening, and then to Los Angeles for Globes this weekend, speeches focused everyone's attention on how the film was made as an independent feature with a mere $15 million budget. Now at awards time it looks like a Hollywood movie. Quoting NPR, producer Teddy Schwartzman addressed the crowd: "Imagine what would happen if nobody knew who Albert Einstein was. That's what happened to Alan Turing. That's why everyone worked for less than they deserved, to tell a story that must be told." To wit, ex-New York mayor and visionary businessman Michael Bloomberg quipped, "You're supposed to overwork and underpay people. That's the way the world works. But in the short term, the movie's main contribution is getting us all to drink."